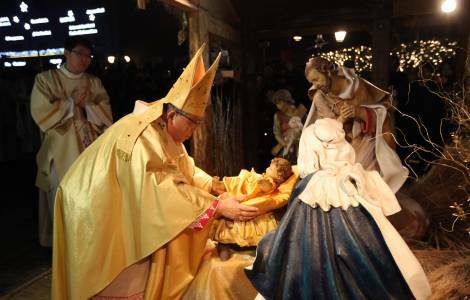 ASIA/SOUTH KOREA - Cardinal Yeom: "At Christmas, let's build peace in Korea"
Seoul (Agenzia Fides) - "The word peace was the most important topic in our lives in this year. Who should be the first to respond to the human desire for peace, full-blown peace with God’s orders, grounded with love and justice? We Christians are called to be the first peace builders in this world". This is what Cardinal Andrew Yeom Soo-jung, Archbishop of Seoul, said in the message sent to his community for Christmas and sent to Agenzia Fides. "As Pope Francis has always stressed - says the text - we should keep mercy in our minds which enables endless forgiveness and unconditional sharing. We, above all, should start from prayers. True peace is God’s gift which we can receive only when we ask for through prayers. Thus, let’s keep devoting our prayers to peace on the Korean Peninsula". The Cardinal recalls the recent peaceful developments registered in the Korean peninsula in 2018 and thanks Pope Francis who, "in every critical moment, prayed for peace on the Korean Peninsula". Referring to "Pacem in terris", Pope John XXIII’s encyclical in 1963, Card. Yeom stresses that "a peaceful world order can be built on the basis of truth, justice, love and solidarity", four pillars. "However - the text continues - the road to peace is long and tough. We, the faithful, should keep patience and continue praying while doing our best in our everyday lives. We, by becoming those on whom his favor rests, finally can achieve peace which Christ promised".